I have had this tin for quite a few years and tatting has been in the back of my mind but i finally went through the tin and sorted it all out. This belonged to my Great Great Aunt Gracy who passed away probably about 25 years ago. I am the one who recieved all this because, though many family members crochet, I am the only one who has taken an intrest in thread so I would be the only one who would eventually get use out of these things. These are all vintage of course. Varing brands from Coats & Clark to Lilly. All are either identified as "Boil safe" or "Boilproof". And nearly all, except a small few, are size 70 thread. IN the back of this photo were all the ribbon that was also in the tin. I just realized that in this photo you can see my battery holder I made out of plastic canvas. I cut it the width and height of the draw and made the sections wide enough to hold various sized batteries. We use rechargeable and this is a great way to keep them organized. This is the shuttle which is stamped "Gen Silver" and the motief and a strand of tatted lace that is 5' long! The photo is taken on my leg and shows how small the work is. 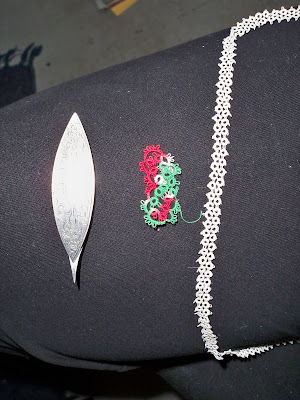 These were some crochet edgings that were also in the tin. Wow! I don't tat, but that looks like some really delicate work. I think there are several on the HGTV site who tat, so I'm sure you'll get some help. Enjoy! 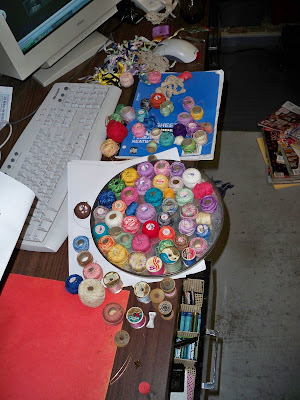 What a pretty fabulous tatting stash you have! I enjoyed seeing the edging your Great Aunt tatted and the little motif. How pretty. THanks for sharing. I hope you do learn to tat sometime. There's a lot more free resources online as well as some inexpensive learn to tat books that some people have found very helpful (one even comes with a DVD). Well if you ever want to see more tatting online you are welcome to come on over to my blog and visit sometime. It's all about the tatting over there! 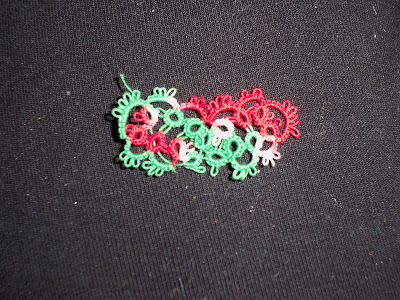 I have several tatting blog links on my sidebar. Do stop by sometime! The crocheted edgings in the bottom photo are pretty, too! Thank you. I will further check out your blog but am about to head to work. 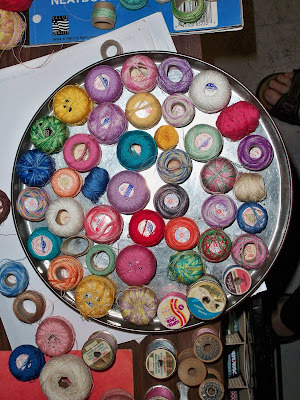 I am looking forward to exploring this new fiber art. I am also looking forward to trying to reproduce her edging w/the clovers on the edge. I have a gift for seeing what others have done and reproducing it. 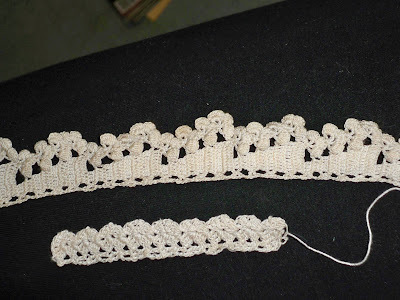 Hi Rachel, pop over to my blog too, it's mainly about tatting. Your grandmothers stash looks like it will give you a lot of pleasure.